Blink-182 will launch a North American tour this summer with A Day To Remember, All Time Low and All American Rejects. The trek will follow their release of Blink’s upcoming album California on July 1, now available for pre-order. 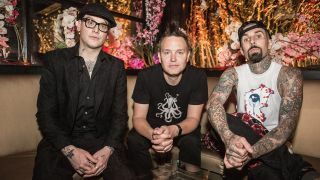 The pop-punk trio recently released Bored To Death, their first single with latest recruit, Alkaline Trio frontman Matt Skiba. He replaced former guitarist and singer Tom DeLonge last year. Producer John Feldmann said of the album: “Tom and Mark really were a pair of lead singers, but Mark sings a lot of people’s favourite songs. “The guys aren’t 23 any more – they’re dads now, so they’re no longer writing songs about poo and that kind of stuff. But there’s still got to be a sense of humour to it. Blink-182 tickets will go on sale on May 6.